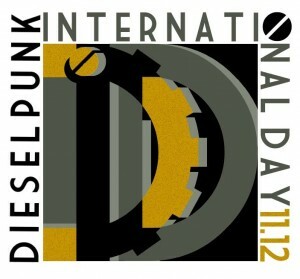 Nach einer kurzen Pause geht es hier wieder weiter, und zwar mit dem »International Dieselpunk Day«! Vor kurzem auf Facebook angekündigt wird er im Spätherbst diesen Jahres stattfinden, genauer am 12. November. dieselpunk.de: What is the idea behind the International Dieselpunk Day? Amyett: The idea behind the International Dieselpunk Day is to unite Dieselpunks around the world for one special and exciting day in a coordinated effort to host events and activities as well as to promote the growing phenomenon of Dieselpunk. dieselpunk.de: What will be happening on this day? Amyett: What might happen is wide open. Those of us that started the ball rolling on this envision Dieselpunks around the world hosting parties, or coordinating with independent movie theaters for special movie viewings of both vintage Diesel Era films along with contemporary Dieselpunk movies as well as other events. I suspect that creative Dieselpunks around the world will dream up many types of fascinating events that I haven’t even thought of. dieselpunk.de: Why did you pick November 12th as the date for the International Dieselpunk Day? Amyett: We chose November 12th because the traditional date for the start of the Diesel Era, which the time period that Dieselpunk builds upon, has been the end of World War I. Everyone knows, or should know, that the ceasefire that ended World War I went into effect on November 11, 1918. Before announcing the International Dieselpunk Day, we sent communications around the world via Facebook and Dieselpunks.org to ask for alternative dates. A few recommended various dates concerning Robert Diesel, who published an essay, “Theory and Construction of a Rational Heat-engine to Replace the Steam Engine and Combustion Engines Known Today” in 1893 and whom the Diesel Engine is named after. However, the problems with Diesel’s birthdate were that it was the opinion of a very small minority and that using an event of the 19th century would place it within the period that’s commonly associated with Steampunk. Therefore, it was agreed that the date for International Dieselpunk Day would be the day immediately following the anniversary of the end of the Great War. dieselpunk.de: How can people who are not organized in a local club or group take part? Amyett: An individual can celebrate in so many ways without being part of a formal group or club. I would imagine most people have friends or family who share some interest in Dieselpunk or vintage Diesel Era movies so have a house party with friends and pop in a DVD. Nearly everyone enjoys megahits such as Indiana Jones and Raiders of the Lost Ark, which was pure Dieselpunk. Another idea would be that many large cities have Swing Dance organizations along with Diesel Era themed nightclubs that individual Dieselpunks can enjoy. Visit a museum displaying Diesel Era art or artifacts. Those are just a few ideas. I would recommend that people follow the web site that we’ve established as well as our Facebook page in which we’re posting articles on a regular basis on various ways to celebrate this day. dieselpunk.de: How did you discover Dieselpunk for yourself? Amyett: Like so many Dieselpunks, I started out as a Steampunk. One day I was surfing the web looking for more and more Steamy stuff until I came across Tome Wilson’s site, Dieselpunks.Org. It was at that moment that I knew that I had found my true passion, which is Dieselpunk. I still enjoy Steampunk and participate in Steampunk activities and events, but I have Diesel running through my veins. Wenn Sie hierzulande eine kleine Feierlichkeit zu diesem Fest veranstalten, dann melden Sie sich doch einfach bei der rechtsstehenden Emailadresse, oder direkt bei Herrn Amyett! Die Idee eines deutschen Dieseltages fände ich sehr interessant. Im November sind auch wenige andere interessante Sachen, das passt also gut. PS: Wann endet dann die Diesel-Ära? Am 06.08.1945? Das darf jeder für sich selbst entscheiden, aber 1945 ist wohl Konsens.